Not only will this super-wide field of view seemingly transport an entire constellation of crystal-clear imagery to the eyes of the beholder, but do so with the amazing realism that has become Nikon’s hallmark for 100 years. The 100th anniversary models bear this commemorative logo. Waterproof structure that will not be affected if submerged in water to a maximum depth of 16.4 feet / 5 m for 10 minutes. (Not designed for underwater usage). Airtight structure with a nitrogen-filled body that prevents the inside of the optical system from fogging and resists mold even with significant changes in temperature. Wide _operating temperature range of -4F to +140F / -20C to + 60c enables use in severe conditions. Magnesium alloy is utilized in body construction, resulting in a sturdy, lightweight body that facilitates handheld viewing. Comes with an exclusive tripod adapter TRA-4. 1/4-in. (ISO1222) tripod screw enables attaching to a tripod. 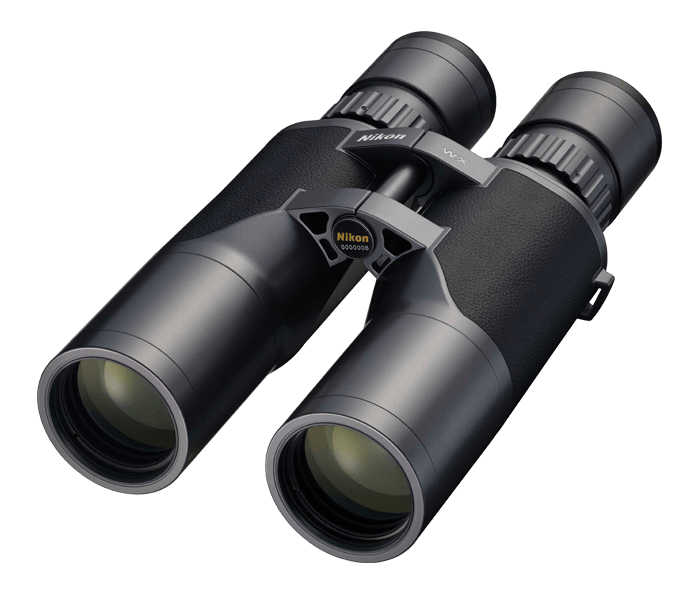 WX binocular’s exclusive case is supplied for storing the _binocular and accessories.